Forests are essential for the transition to the green economy. 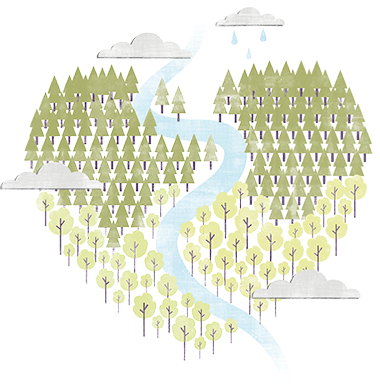 Well-managed planted forests are a vital element in the global forestry mix. Australia’s planted forests are managed in accordance with some of the world’s highest standards of forest management. Initiatives such as the FAO Guidelines for Responsible Forest Management of Planted Forests and the New Generation Plantation Project help maintain ecosystems and biodiversity, protect high conservation values, involve multiple stakeholders and aid economic development. Australia’s forests absorb more greenhouse gases from the atmosphere than they release and therefore help to offset Australia’s contribution to global greenhouse gas emissions. Planted forests create ‘Shelterbelts’.The benefits of shelter to the environment have long been recognised and include protection of crops, livestock and the home, reduction of soil erosion, salinity control and biodiversity improvements. Australia’s State of the Forests Report 2013 states that Australia has 125 million hectares of forest cover comprising 123 million hectares of native forest, 2.02 million hectares of planted forests and 0.15 hectares of other forests. This is equivalent to 16 percent of total land area and works out at approx. 5.33 ha per person based on population of 23,450,000. ‘Planted forests can be environmentally sound sources of renewable energy and industrial raw material’. There are around 25 million hectares of planted forests worldwide, representing 0.2 percent of global land area. They are usually tropical fast growing planted forests of acacia and eucalyptus as well as northern conifers. Planted forests in Australia cover about two million hectares, which is just more than 1 percent of Australia’s total forest estate and a relatively small area compared to other crops like wheat and barley. -Department of Agriculture, Fisheries and Forestry. (2013). Australia’s Forest. Worldwide re-forestation will require expansion of a range of planted forest types. The WWF Living Forests Model projects that 250 million additional hectares of new tree planted forests for all end uses need to be established by 2050.